I have a problem, I have an object which needs to be editable via a textarea. The object is binded via ng-model with the textarea. Because it is JSON it is handy to have it parsed down to a nice style, so I used the json filter build in to Angular. 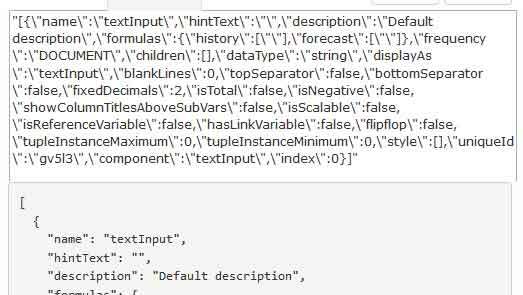 But this renders the JSON in the textarea with a lot of backslashes. They seem to be at the place where a linebreak should be. I would like the JSON be renderd in the textarea the same as in the div. So my question: How do I get the textarea formatted the same way as the div? Just remove angular.toJson() because the value is already in json-format!